OTTAWA, ONTARIO--(Marketwired - June 12, 2017) - CannaRoyalty Corp. (CSE:CRZ)(CSE:CRZ.CN)(CNSX:CRZ)(OTCQX:CNNRF) ("CannaRoyalty" or the "Company") announced today the Company's investee Natural Ventures PR, LLC ("Natural Ventures") has launched CR Brands in Puerto Rico, one of the fastest growing medical cannabis markets in North America. This represents another example of CR Brands executing its previously announced strategy to expand through its distribution channels through North America, as discussed further below. Under license from CannaRoyalty, Natural Ventures has begun the manufacture and distribution of CR Brands in Puerto Rico, starting with Soul Sugar Kitchen™ gourmet-edibles and GreenRock Botanicals™, premium vape pens. Soul Sugar Kitchen has developed a line of award winning gourmet cannabis edibles include truffles, peanut butter cups, savory mixes and jellies. GreenRock Botanicals™, premium vape pens offer a high quality vaporizing experience servicing discerning cannabis patients, emphasizing ease of use, sleek hardware design, and consistent performance. Natural Ventures is Puerto Rico's largest licensed cultivation, manufacturer and distributor with an impressive 100,000 square foot indoor cultivation facility. Natural Ventures is also one of only two companies in Puerto Rico that has received a manufacturer's license for its 30,000 sq ft full state of the art labs for processing, testing and distribution. Natural Ventures has full market distribution and is currently selling to every active dispensary in Puerto Rico. In addition to a 10-year 2.5% financing royalty on Natural Ventures's net profits, CannaRoyalty also earns a further 10% licensing royalty on gross revenues generated from products licensed by Natural Ventures from CannaRoyalty for the Puerto Rican market. "The launch of key products from CR Brands into the attractive Puerto Rican medical cannabis market is a strong demonstration of our CR Brands expansion strategy. It leads to product licensing revenues and assists our investee, Natural Ventures, expand its product offering in this high growth market which we also benefit from through our net income royalty," said Marc Lustig, CEO of CannaRoyalty. "They just get it," said Edgar Montero, CEO of Natural Ventures. "We are thrilled about expanding our relationship with CannaRoyalty by launching a number of products from the CR Brands portfolio. Initial reaction from leading dispensaries has been very positive as both Puerto Rico and the Caribbean have not been exposed to such a breadth of quality products. Beyond the products, we are able to benefit from CannaRoyalty's professional branding, marketing and support, which we believe is best in class. We are confident that with CannaRoyalty now having an incentive on both top line success and net profits, this will further align our organizations to capitalize on the exceptional Puerto Rican medical cannabis market opportunity." The U.S. island territory of Puerto Rico legalized medical cannabis for qualifying health conditions in 2015 and permits the use of medical cannabis derivatives only (e.g. capsules, extractions, lotions, patches, edibles, suppositories, flower and oils). Puerto Rico's population is estimated at 3.6 million and receives 2 million tourists annually. 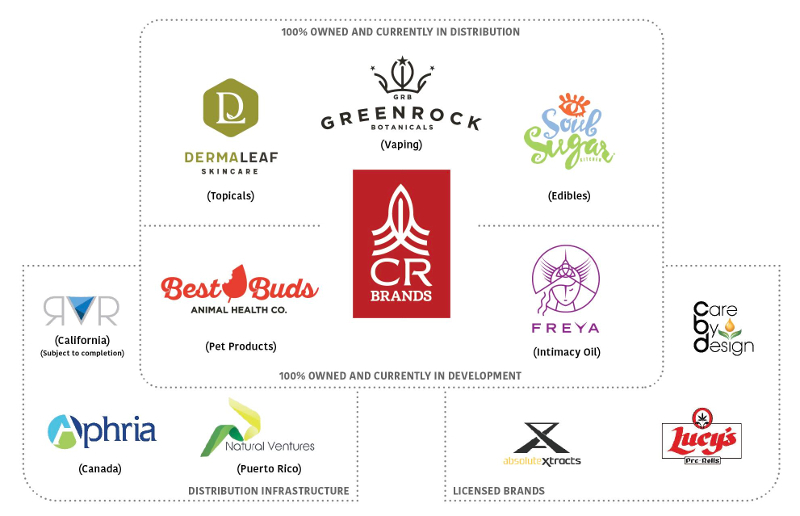 As previously announced, CannaRoyalty has assembled a broad portfolio of wholly-owned and licensed cannabis brands under its CR Brands division. The launch of additional CR Brands products in Puerto Rico confirms the continued success of CR Brands in executing its strategy to develop, sell and market its brand portfolio in a number of established distribution channels throughout North America, and ultimately, on a global basis. A graphical representation of CR Brands' portfolio of owned and licensed brands, together with its distribution channels, is included. In California, CannaRoyalty and leading distributor River recently completed a strategic transaction that contemplates preferred distribution of CR Brands products, including a $20 million purchase commitment. 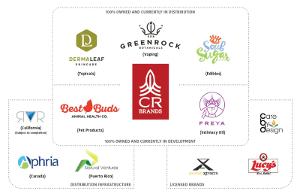 CR Brands' products have also been made available for future distribution under license in Canada by leading licensed producer Aphria (TSX:APH). CannaRoyalty will continue seeking additional distribution channels by leveraging its existing relationships in other jurisdictions in North America and internationally. A graphical representation of CR Brands' portfolio of owned and licensed brands, together with its distribution channels.